Tributes have been paid to a teenager killed in a crash on the B660 near Peterborough. 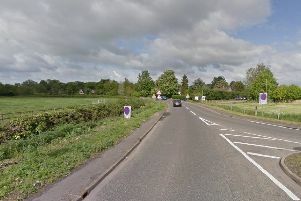 Kieran Carrington-Walker, 19, of Bruces Close, Conington, was a passenger in a Landrover Discovery when it crashed on the B660 Glatton Lane at about 5.45pm on Wednesday, May 24. Ryan Davenport said: “He was a work colleague that became a good friend of mine, and many others at Parkside pools and gym. A Go Fund Me page has been set up to help pay for Kieran’s funeral costs and has already raised £3,763. Martin Ball who set-up the page posted: “Kieran Carrington-Walker, aged 19, tragically taken away in a devastating car accident on May 24th 2017. “He was a true gentleman with a kind heart. If everyone that posted on his fb donates just a tenner it could go a long way to helping out with the costs. “We’ve known each other since we were about six-years-old through rugby. Since then we’ve been close and his family have done a lot for me and this page is the least I could do.